First off as the other 4 have stated this storyline is much overdone yet as stated in the first review it is very good series. The love story was incredibly simple yet it fit with all the other characters and all the characters were decently defined so that u knew enough to keep the story moving. and those who link this storyline with Negima or whatever it is, all I have to say is learn to enjoy any series that holds to that same storyline type stop making all similar ones that are just as good not get watched. Basically it is your typical love story with a twist of magic in there. The music is good as it fits with what is happening at that point in the show. The animation is top notch. Overall I'd say its worth the watch it was cute and even had an episode with decent fan service. only thing i might save ya from is skip the 2 episodes after ep. 5 as its kinda really boring and ya can figure out what happened by watching the 8th ep. If you liked this one or if you didn't that's fine but give every anime a fighting chance and don't just say its crud or whatever give us some reasoning to believe what you are saying. Yet still watch the series no matter what others say cause like me you might actually really like it. I may think that I must be too harsh on shojo animes, but with expectations such as Nanoha and Shana, you would have expected shojo animes to be better. Well this is prove that not all are good. First, the LACKING rating feature in Crunchyroll: GRAPHICS. I will give 2/5 for graphics of the anime only. The reason why it is not the average "3" is because it simply didn't make it. Missing details are not often, but if you notice them, they are peppered here and there. Most apparent is when many people rush out of somewhere, and ALWAYS, you can see the SAME person running... so it looked as if the clones of the person is rushing out, instead of a crowd. The storyline also lacks. In general, I think that it moves in a ok sort of development, but at the end of the story, there is no much impact made with the story. This is perhaps because the entire thing is too focused on the school life of the students and lacks the true plot development. Perhaps that is because the tagline (focus) of the anime is "It's a happy & heartful school life." There are definitely other better shojo animes. This anime was well thought out. It doesn't drift from what a love story should be. The flashbacks coincide perfectly to support the story. The title of the anime/game is a perfect way to describe how the anime makes you feel. The love story starts out from childhood, turns into a crush, and gives meaning to the magic of love. The story shows how love can change the property of something and have it being used for good instead of destruction. I have to admit, I didn't like the entrance theme but for some reason its stuck in my head. The music itself isn't terrible, perhaps I just disliked it because I liked it so much. There were enough characters to pull this anime together perfectly. Each character had a significant role that tied this show and made it run smoothly that by the end of the series, you'll be like what it's over? Having the key element of magic in this anime made it a joy to watch, just because it wasn't just some other love story. The elements of magic were drawn perfectly, and the character shape and development were drawn nicely as well. I gave this a high rating because they were able to intertwine a love story with a twist (magic). The characters supported each other (even with unique characteristics i.e. Jun). Emotions flew freely, and no abrupt scenes happened were the story would take a turn for the worse. This anime leaves you feeling happy, the only time I felt that something should have not happened was in the OVA with Jun. Probably one of my 10 favorite animes. A decent entry into the magical girl+school life+harem genre. Distinguished mostly by the theme that even well-intentioned magic can have bad consequences, both in the humorous scenes with blondie and Paella, and the main stories in the plot. A fun, light-hearted series that can engage the viewer despite its lack of originality. Animation quality is so-so: well-done, but nothing special. Music is fluffy and happy. The back-story and romantic plot create enough drama to hold your interest. This type of series has been done better, but if you're young this one will save you digging through old DVDs for originals, and if you're older it's good enough to keep you watching as a guilty pleasure. Sometimes a lack of originality just means making good stories available to new audiences. Romance, Magic, Mystery Oh My! Overall I really liked this anime. I don't regret watching it at all. I suggest watching it to everyone, especially if you have free time on your hands. There is magic, Mystery, and a little romance in it ^^ What more could you want! I was a little disappointed that it ended so quickly though. And that the romance never really got far, but other than that I loved it! Watch out, it throws a few surprises at you too! Definitely watch this anime!!!!!! So, I came into this anime expecting a simple slice-of-life feel to it, with many comedic bits. And for most of the series, that's what it was. With a little magic thrown in. But then, the last 5 or 6 episodes...man, it got serious, and somewhat dark. But in a good way. I really enjoyed the contrast, and even when the plot thickened, there was still enough comedic relief to ease the tension. A great show about the magic of friendship, as cheesy as that sounds...haha!! 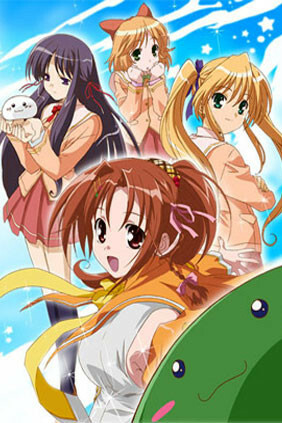 This anime features an action, fantasy, and slight romance. I decided to watch this anime because of the reviews that was applied to it and I have my disagreements but as an overall, the story line played out pretty flat, however that was also what made it very interesting. There are not many characters so it was easy to track who is who and their own unique personalities. The story is very straight forward and at some points is really boring but at the same time it was also what made it really fun to watch. I think this is just a very "fun" anime to watch if you know what I mean. There is not much romance played in this anime and it was more focused in the fantasy. If you are planning to watch this anime or considering; be sure to know your genres as this really focuses on fantasy. ps. those tama-chans are extremely adorable. With a few clever twists here and there, this is your standard Magic-Girl anime with all the fun you would expect of the top-notch titles in the business. Watching with some friends, I had most of them saying it was "better than Sailor Moon". Give it a go, I'm sure there's Happiness to be found here for you, too! It wasn't really what I expected.. but I guess it's pretty decent. Just doesn't attract me so much like Shugo Chara and Yumeiro Patissiere. But I guess it's cool and cute. I like the storyline, but I wasn't hoping for magic and all that stuff. Maybe a little romance and school life more?